ABOUT DFW PRINTING COMPANY, INC.
DFW Printing Company has been operating in the Dallas/Fort Worth area since 1969. In that time we have become one of the most technically proficient and dependable printers in the North Texas area. From national publications such as the USA Today to local college publications such as TWU and UNT our clientele list is as diverse as the North Texas area. DFWPC staff has likewise been with us in the printing industry for decades, learning the skills necessary to enable us to maintain the quality of printing that you expect. Our sales and support personnel pride themselves on personal service to our customers 24/7. We are your Partner in Printing at DFW Printing Company, Inc.
Beginning with our sales and customer support personnel, you will be given one on one service to ensure your printing needs are met. We want to understand exactly what your needs are. We will explain how we will deliver your product and at what specific cost. We strive for clarity in our dealings with our customers. 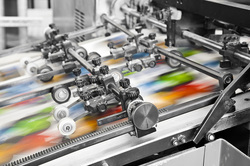 Our state of the art pre-press department is available day and night to assist you. We pre-flight all incoming files to ensure the finished products quality. We can make suggestions to your artists or optimize files in house. We always welcome our customer’s involvement in the process to whatever level they are comfortable. On average, our employees have 20 years experience in the industry. All have had extensive training in their discipline. It is because of our employee’s dedication that we are confident we can offer you the highest level of quality and dependability in the North Texas area as well as across the nation. Unlike most other printers in the area, we can print/stitch/insert most jobs in a single pass, saving you money.